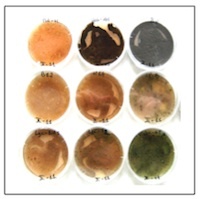 The objective of this WP was to screen more than 130 strains of Ampelomyces, isolated from many different powdery mildew species infecting various host plant species in many parts of Europe, North America and Asia, and available in the culture collection of PPI (P03), for the following characteristics: (i) growth and sporulation rate in culture (Fig. 1), and (ii) sporulation rate and spread in E. necator colonies on grapevine leaves (Fig. 2). Before starting the screening work, a comprehensive screening protocol was developed to evaluate, both in vitro (WP1) and in planta (WP2), the candidate Ampelomyces strains for their potential use as BCAs against E. necator. Fig. 1 – strains growing and sporulating on Czapek medium Fig. 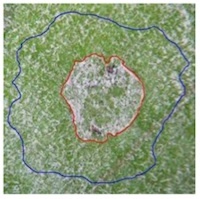 2 – Parts of the powdery mildew mycelium covering a grapevine leaf inoculated with a 10 μl droplet of conidial suspension of an Ampelomyces strain (marked with red line) and subsequently colonized by Ampelomyces pycnidia (marked with blue line). Magnification: 20x.